User encounters an error, “Execute Point Cloud Tasks: Error setting up the transformation: A target vertical coordinate system was specified, but the source vertical coordinate system was not.”, when attempting to use the Reproject/Shift LAS point cloud task in LP360. This error typically occurs when the vertical coordinate system of the input files (source) have not been defined. The following steps explain how to define the vertical coordinate system of the source files. Right click the LAS layer in the table of contents and click Properties (bottom of menu) to open the layer properties dialog. Click the Source tab to open the source properties dialog. Click the ellipse button to open the Select Output Coordinate System dialog. Select the vertical datum that matches the source file (input file). Click Apply on the layer properties dialog and then close the layer properties dialog. 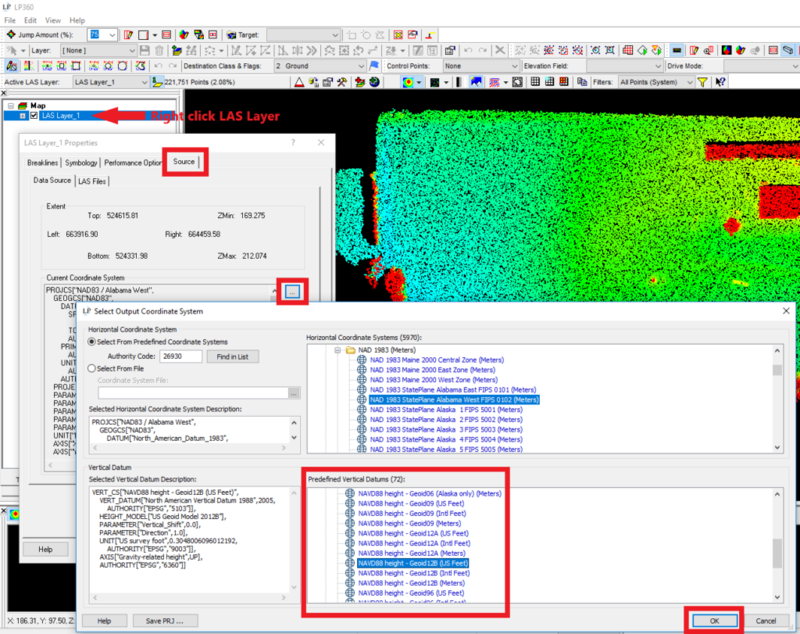 You should now be able to execute the Reproject/Shift LAS point cloud task. This entry was posted in AirGon Tools, Tips and Workflows, LP360 Tools, Tips and Workflows and tagged LP360 error, reproject/shift las, Source, transformation error, vertical.